The 15-story Lovejoy Wharf condominium building is complete and occupancy is expected to begin this summer. The custom unitized curtainwall provided by IBG enhances the unobstructed views of the downtown Boston and Cambridge area. IBG is proud to be working on our 5th building at the Ink Block development for National Development, Cranshaw Construction, and Elkus Manfredi! Read the latest updates on this project here. IBG to start installation soon at 345 Harrison! The east tower is near topping off at 345 Harrison and IBG will begin installation of the curtainwalls, entrances and much more. We are happy to be a part of another exciting project in Boston’s South End! Read more about this project and the latest updates here. IBG will be providing the curtainwalls and windows for a new Cambridge lab building located at 35 Cambridge Park Drive. The Alewife Research Center will receive a complete renovation and upgrade, featuring a new glass façade and 2-story addition and is scheduled to open in 2018. Ipswich Bay Glass is pleased to announce the launch of their new website at IBGlass.com. The new design is more modern, visual, user-friendly and clearly communicates the firm’s solutions, services and facilities. It also features a news section and dramatic portfolio. The new site was developed by Single Source Marketing, a full service marketing, branding and advertising agency in Danvers, MA. Ipswich Bay Glass mentioned in PRISM for key role as glazing contractor/installer of Logan International Airport’s dynamic façade. IBG’s curtainwalls help create new, modern “landmark” as Sephora opens at site of Faneuil Hall’s flower market. Congratulations to Mecanoo/Sasaki on being recognized for an innovative design. 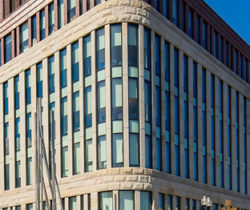 The Bruce C. Bolling Municipal Building was chosen for the Boston Society of Architects’ 2016 People’s Choice Award. 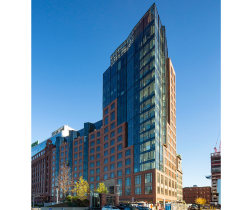 IBG provided custom pre-glazed windows and curtainwalls for this project located in Dudley Square. Putting the finishing touches on 100 Binney Street! The façade is almost complete at 100 Binney Street in Kendall Square. The new 10-story Class A lab and office building features a remarkable curved curtainwall and is scheduled to open this Fall. Shawmut and Columbia Property Trust, Inc. unveil a reimagined 116 Huntington Avenue in Boston’s historic Back Bay. 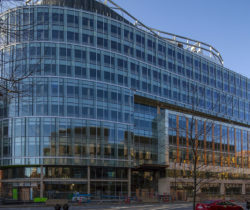 Extensive renovations to the main entrance and lobby include an updated façade featuring a two-story curtain wall provided by IBG/Pilkington Systems.